On Tuesday, November 19, 4,700 people from all fifty states called the United States Congress in support of legislation to make the State Department Office to Monitor and Combat Trafficking in Persons (TIP Office) a full-fledged bureau. This avalanche of calls that swamped the Capitol Switchboard was the culmination of IJM’s effort to engage students and other advocates in a “Day of Action” to make policy makers aware of the importance of one of our nation’s diplomatic treasures, the TIP Office. Our goal was to secure dozens of new cosponsors to S.1249 and H.R.2283, the legislation that would upgrade the TIP Office to bureau-level status. My colleague Tim Gehring calls these bills “little, because they don’t cost anything, they don’t create new bureaucracy, and they don’t add duties: all they do is change the name of the TIP Office to Bureau, and change the title of the Ambassador-at-Large who heads it to “Assistant Secretary of State.” But, as Tim goes on to say, this little bill does a great deal. With that one small change of name, the TIP bureau would have the stature of the State Department regional bureaus that so often resist making an issue of modern day slavery. Upgrading the TIP Office within the State Department will allow the Office’s head, Ambassador Lou CdeBaca, the daily opportunities to be able to speak into important decisions that affect the fight against human trafficking. All too frequently, Ambassador CdeBaca isn’t even at the table when key decisions are being made about U.S. diplomacy in slavery-burdened countries. 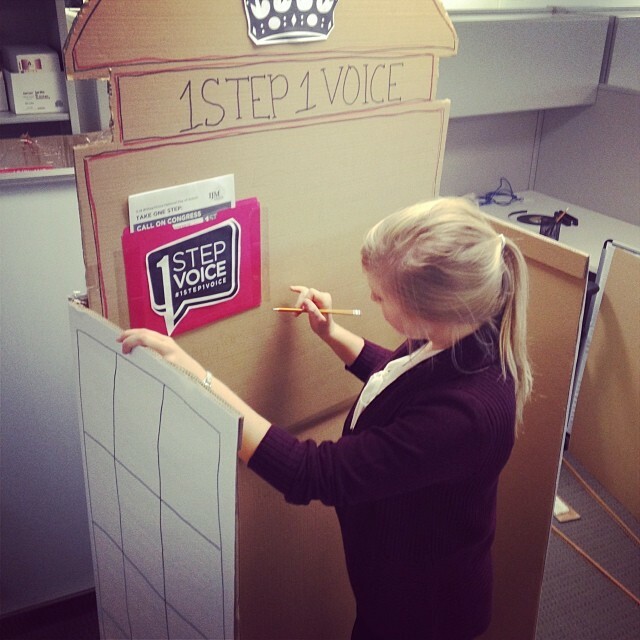 Our recent campaign that I mentioned earlier was called 1 Step 1 Voice. The idea is that by taking just one small step and letting Congress hear your voice, you can help in a global campaign to end slavery. We encouraged students and other advocates not only to call, but to urge their friends and family to do the same. And we got back wonderful photos of people all over the U.S. who were doing just that. Here at IJM headquarters, our intern, Lauren, built a cardboard model of a London phone booth and invited our 120-plus staff to bring their mobile phones, make a call, and sign their names on the booth. Here’s a picture, which just proves that at IJM, we try to make our Congressional advocacy meaningful—and fun!